Victor E. Cabrera, Ph. D.
For an extensive list of publications from Dr. Cabrera, click here. Jones, B. 2017. By the Numbers: Protect Against Interest Rates Increases. PDPW Dairy’s Bottom Line: 8-9. Cabrera, V. E. 2017. Helping dairy farmers to improve economic performance utilizing data-driving decision support tools. Animal 00:00-00. Bach, A., and V. E. Cabrera. 2017. Robotic milking: feeding strategies and economic returns. Journal of Dairy Science 100:7720-7728. Liang, D. F. Sun, M. A. Wattiaux, V. E. Cabrera, J. L. Hedtcke, and E. M. Silva. 2017. 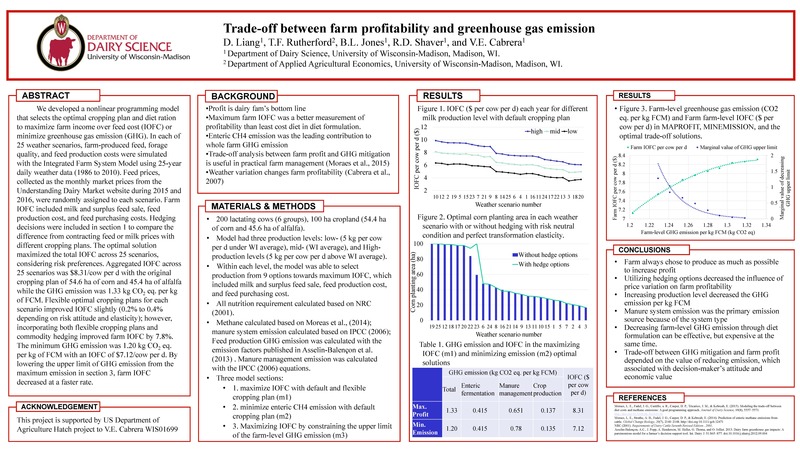 Effect of feeding strategies and cropping systems on greenhouse gas emission from Wisconsin certified organic dairy farms. Journal of Dairy Science 100:5957-5973. López-Gatiusa, F., C. Andreu-Vázquez, R. Mur-Novalesd, V. E. Cabrera, R. H. F. Hunter. 2017. The problem of twin pregnancies in dairy cattle. A review on practical prospects. Livestock Science 197:12-16. Krpalkova, L, V. E. Cabrera, J. Kvapilik, and J. Burdych. 2016. Associations of reproductive and health problems with the performance and profit of commercial dairy cows. Agricultural Economics 62:385-394. Krpalkova, L, V. E. Cabrera, J. Kvapilik, and J. Burdych. 2016. Dairy farm profit according to herd size, milk yield, and number of cows per worker. Agricultural Economics 62:225-234. Batista, E. O. S., L. M. Vieira, M. F. Sá Filho, P. D. Carvalho, H. Rivera, V. E. Cabrera, M. C. Wiltbank, P. S. Baruselli, and A. H. Souza. 2016. Field fertility in Holstein bulls: Can type of breeding strategy (artificial insemination following estrus versus timed artificial insemination) alter service sire fertility? Journal of Dairy Science 99:2010–2015. Kalantari A. S., L. E. Armentano, R. D. Shaver, and V. E. Cabrera. 2016. Economic impact of nutritional grouping in dairy herds. Journal of Dairy Science 99:1672–1692. Cabrera, V. E., and A. S. Kalantari. 2016. Economics of production efficiency: Nutritional grouping. Journal of Dairy Science 99:825–841. Qi, L., B. E. Bravo-Ureta, and V. E. Cabrera. 2015. From cold to hot: Climatic effects and productivity in Wisconsin dairy farms. Journal of Dairy Science 98:8664–8677. Mahnani, A., A. Sadeghi-Sefidmazgi, and V. E. Cabrera. 2015. Consequences and economics of metritis in Iranian Holstein dairy farms. Journal of Dairy Science 98:6048-6057. Shahinfar, S., J. N. Guenther, D. Page, A. Samia-Kalantari, V. E. Cabrera. P. M. Fricke, and K. A. Weigel. 2015. Optimization of reproductive management programs using lift chart analysis and cost sensitive evaluation of classification errors. Journal of Dairy Science 98:3717-3728. Liang, D., and V. E. Cabrera. 2015. Optimizing productivity, herd structure, environmental performance, and profitability of dairy cattle herds. Journal of Dairy Science 98:2812-2823. Kalantari, A. S., V. E. Cabrera. 2015. Stochastic economic evaluation of dairy farm reproductive performance. Canadian Journal of Animal Science 95:59-70. Contreras-Govea, F. E., V. E. Cabrera, L. E. Armentano, R. D. Shaver, P. M. Crump, D. K. Beede, and M. J. VandeHaar. 2015. Constraints for nutritional grouping in Wisconsin and Michigan dairy farms. Journal of Dairy Science 98:1336-1344. Aguirre-Villegas, H.A., T.H. Passos-Fonseca, D.J. Reinemann, L.E. Armentano, M.A. Wattiaux, V.E. Cabrera, J.M. Norman, R. Larson. 2015. Green cheese: Partial life cycle assessment of greenhouse gas emissions and energy intensity of integrated dairy production and bioenergy systems. J. Dairy Sci. 98:1571-1592. Kalantari, A. S., V. E. Cabrera. 2015. Stochastic economic evaluation of dairy farm reproductive performance. Canadian Journal of Animal Science. 95:59-70. Contreras-Govea, F.E., V.E. Cabrera, L.E. Armentano, R.D. Shaver, P.M. Crump, D.K. Beede, M.J. VandeHaar. 2015. Constraints for nutritional grouping in Wisconsin and Michigan dairy farms. J. Dairy Sci. 98:1336-1344. Cabrera, V. E. 2014. Economics of fertility in high-yielding dairy cows on confined TMR systems. Animal. 8:211-221. Akins, M.S., and R. D. Shaver. 2014. Influence of corn silage hybrid type on lactation performance by Holstein dairy cows. J. Dairy Sci. 97:7811-7820. Fonseca, A.C., S.M. Fredin, L.F. Ferraretto, C.M. Parsons, P.L. Utterback, and R.D. Shaver. 2014. Short Communication: Intestinal digestibility of amino acids in fluid- and particle-associated rumen bacteria determined using a precision-fed cecectomized rooster bioassay. J. Dairy Sci. 97:3855-3859. Krpalkova, L, V. E. Cabrera, M. Vacek, M. Stipkova, L. Stadnik, and P. Crump. 2014. Effect of prepubertal and postpubertal growth and age at first calving on production and reproduction traits during the first 3 lactations in Holstein dairy cattle. J. Dairy Sci. 97:3017-3027. Shahinfar, S, A. Kalantari, V. E. Cabrera, K. Weigel. 2014. Short communication: Prediction of retention pay-off using a Machine Learning algorithm. J. Dairy Sci. 97:2949-2952. Dutreuil, M., M. Wattiaux, C.A. Hardie, and V.E. Cabrera. 2014. 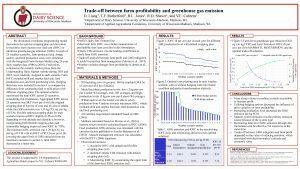 Feeding strategies and manure management for cost-effetive mitigation of greenhouse gas emissions from dairy farms in Wisconsin. J. Dairy Sci. 97:5904-5917. Hardie, C.A., M. Wattiaux, M. Dutreuil, R. Gildersleeve, N.S. Keuler, and V.E. Cabrera. 2014. Feeding strategies on certified organic dairy farms in Wisconsin and their effect on milk production and income over feed costs. J. Dairy Sci. 97:4612-4623. Krpalkova, L., V.E. Cabrera, J. Kvapilik, J. Burdych, and P. Crump. 2014. Associations between age at first calving, rearing average daily weight gain, herd milk yield and dairy herd production, reproduction and profitability. J. Dairy Sci. 97:6573-6582. Shahinfar, S., D. Page, J. Guenther, V.E. Cabrera, P. Fricke, K. Weigel. 2014. Prediction of insemination outcomes in Holstein dairy cattle using alternative machine learning algorithms. J. Dairy Sci. 97:731-742. Cabrera, V.E., and J.O. Giordano. 2013. Evaluating the economic value of changing the reproductive management program for a specific dairy farm. DAIReXNET eXtension. 23 October 2013. Giordano, J. O., P. M. Fricke, and V. E. Cabrera. 2013. Economics of resynchronization strategies including chemical tests to identify non-pregnant cows. J. Dairy Sci. 96:949-961. Giordano, J.O., P.M. Fricke, and V.E. Cabrera. 2013. Economics of resynchronization strategies including chemical tests to identify non-pregnant cows. J. Dairy Sci. 96:949-961. Giordano, J.O., A.S. Kalantari, P.M. Fricke, M.C. Wiltbank, V.E. Cabrera. 2012. A daily herd Markov-chain model to study the reproductive and economic impact of reproductive programs combining timed artificial insemination and estrus detection. J. Dairy Sci. 95:5442-5460. Kalantari, A. S., and V. E. Cabrera. 2012. The effect of reproductive performance on the dairy cattle herd value assessed by integrating a daily dynamic programming with a daily Markov chain model. J. Dairy Sci. 95:6160–6170. Cabrera, V. E. 2012. A simple formulation and solution to the replacement problem: A practical tool to assess the economic cow value, the value of a new pregnancy, and the cost of a pregnancy loss. J. Dairy Sci. 95:4683-4698. Kalantari, A. S., V. E. Cabrera, D. Solis. 2015. A comparison analysis of two alternative dairy cattle replacement strategies: Optimization versus simulation models. Revista Economía Agraria ISSN 0718-9141. 18:12-24. Overton, M. W., and V. E. Cabrera. Accepted July 2016. Monitoring and quantifying value of change in reproductive performance. In: Large Dairy Herd Management Book. American Dairy Science Association. Liang, D., and V. E. Cabrera. 2017. Dairy Farm Management Strategies to Reduce Greenhouse Gas Emissions: Mitigation Strategies and Economic Considerations in the US. in: Agricultural Research Updates. Volume 20. Nova Science Publishers. Krpálková, L., V. E. Cabrera, J. Kvapilik, J. Burdych, M. Štipková, P. Crump, L. Stádnik, and M. Vacek. 2014. Optimal growth of heifers and effect of milk yield level on dairy herd production, reproduction, and profitability. LAP LAMBERT Academic Publishing, Saarbrücken, Deutschland, Germany. Cabrera, V. E. 2012. DairyMGT: A suite of decision support systems in dairy farm management. IN Decision Support Systems. Jao C. (Ed), INTECH, Rijeka, Croatia. Cabrera, V. E., P. E. Hildebrand. 2012. Chapter 7: Linear programming for dairy herd simulation and optimization: An integrated approach for decision-making. IN Linear programming – New frontiers in theory and applications. Zoltan, A. M. (Ed. ), Nova Science Publishers, Inc., Hauppauge, NY. Cabrera, V. E., D. Solís, G. A. Baigorria, and D. Letson. 2009. 7th: Managing climate variability in agricultural analysis. IN: Long, J.A., and D. S. Wells (Eds. ), Ocean circulation and El Niño: New research, p. 163-179, Nova Science Publishers, Inc., Hauppauge, NY. V. E. Cabrera. Sustainable production of dairy farm systems. In Proc. VI Brazilian Symposium on Sustainable Agriculture and III International Symposium on Sustainable Agriculture, Federal University of Viçosa, Brazil. 26-27 September 2014. Cabrera, V.E and A. Kalantari. 2014. Strategies to improve economic efficiency of the dairy. In Proceedings. Western Dairy Canadian Dairy Seminar. Red Deer, Alberta, Canada. Advances in Dairy Technology 26:45-55. Dutreuil, M., Gildersleeve, R., and V. E. Cabrera. 2012. Dealing with high feed cost: Supplementation on pasture. In Proceedings. 4th Annual World Dairy Expo Grazing Seminars. Alliant Energy Center, Madison, WI. 5 October 2012. Hardie, C. A., V. E. Cabrera, M. Dutreuil, and R. Gildersleeve. 2012. Characterization of certified organic Wisconsin dairy farms: Management practices, feeding regimes, and milk production. In Proceedings UW-Extension Grazing, Teaching, and Technology Conference. US Dairy Forage Research Center, Prairie du Sac, WI. 28 August 2012. Dutreuil, M., V. E. Cabrera, R. Gildersleeve, and C. A. Hardie. 2012. Factors affecting profitability on Wisconsin dairy farms. In Proceedings UW-Extension Grazing, Teaching, and Technology Conference. US Dairy Forage Research Center, Prairie du Sac, WI. 28 August 2012. Cabrera, V. E., F. Contreras, R. D. Shaver, L. E. Armentano. 2012. Grouping strategies for feeding lactating dairy cattle. Pp. 40-44 in Proceedings Four-State Dairy Nutrition and Management Conference. Dubuque, IA, 13-14 June 2012. Halbach, Theodore J. 2014. Learning linear evaluation. Hoard’s Dairyman. 10 January, 2014. Halbach, Theodore J. 2014. Analyzing the frame. Hoard’s Dairyman. 25 January, 2014. Hardie, C. A., V. E. Cabrera, M. Dutreuil, and R. Gildersleeve. 2012. Characterization of certified organic WI dairy farms: Management, feeding regimes, and milk production. Pp. 20. Midwest Forage Association Forage Focus. December 2012. Cabrera, V. E. 2012. Free online app lets you calculate the cow value. Pp. 646. Hoard’s Dairyman. 10 October 2012. Halbach, Theodore J. 2009. PDCA unveils new dairy cow scorecard. Hoard’s Dairyman. 10 August, 2009.